The world of micro.blog — fitting some of the pieces together (at least in my mind). Image is best viewed large (i.e. in browser or Sunlit). 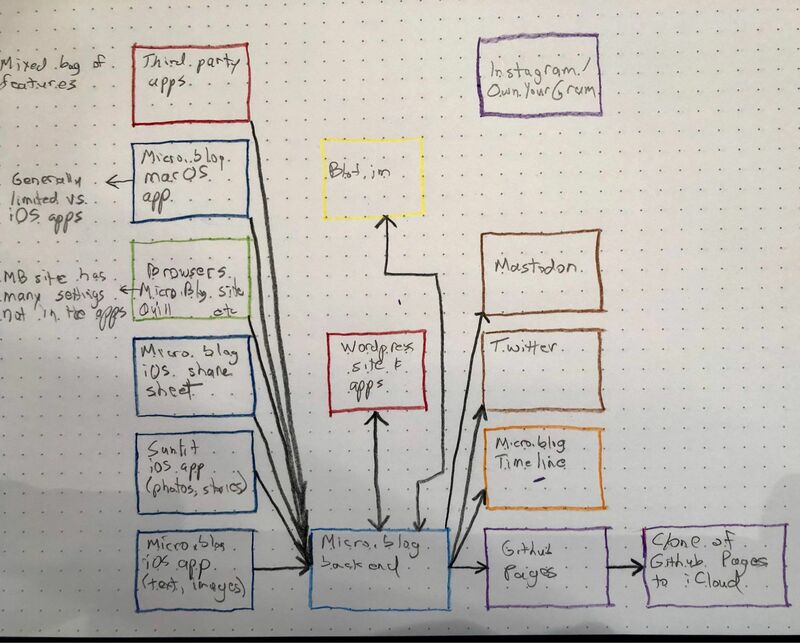 There are a lot of pieces and connections (some required, some optional) for users adopting Micro.Blog. As a new user back in January I was often a bit muddled about the relationships. I decided to map out the ones I’m aware of. I’ve used many of these myself. The left column lists many of the ways a user can post using micro.blog. This is more important than you might think because none of those boxes is equal to the other. They each have limitations/advantages or bugs that impact what you can/can’t do. Especially early on I spent a fair amount of time trying to figure out which to use. It’s gotten better lately. The center column, above the backend, has some apps/sites that also host blogs (I just listed WordPress and blot.im for now). Along the bottom I drew the micro.blog backend in the center pushing updates to Github pages which is then cloned to a repo on my Mac. Since that clone is in an iCloud folder it serves as a sort of crude and imperfect backup of last resort. The column on the right shows destinations other than Github pages: the micro.blog timeline, Twitter, Mastodon, and etc. I put Instagram there as well but I didn’t connect it yet because I haven’t successfully used OwnYourGram (I’m sure I just need to spend more time on it). N.B. I don’t currently cross-post to Twitter either. I’m a rather visual person for data like this so it is helpful to me. Not sure if it helps anyone else.